Just like it's hard to fall asleep when it's too hot in bed, it's difficult for some to fall asleep when it's really cold. Avoid this unpleasant scenario by investing in a heated mattress pad so that by the time you are ready to check out for bedtime, your bed and blankets are already toasty. For a more DIY approach, use a heated water bottle and heated fabric pads filled with uncooked rice or beans and place them under your blankets before bedtime. Additionally, cover your head and feet and eat a high-fat, high-calorie snack (like cottage cheese and peanut butter) before bed, which will help warm your body while you are sleeping. 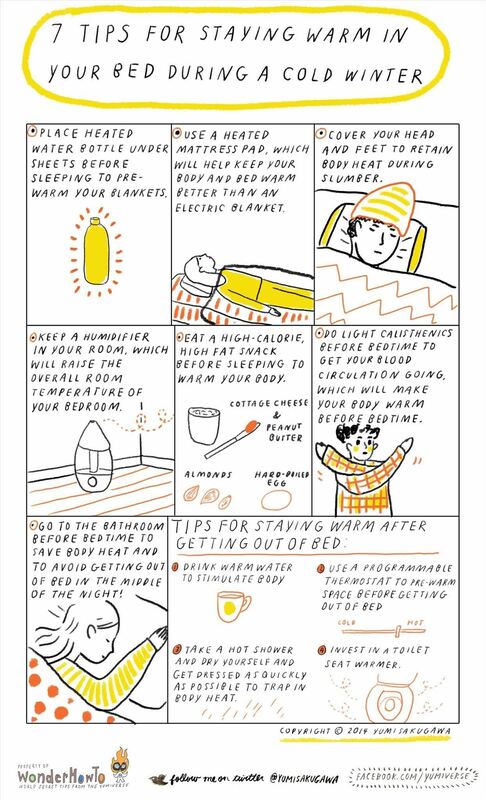 For more tips on staying warm during the wintertime, check out my previous post, 9 DIY Tips for Staying Warm in the Winter.